While you explore Coppin’s Gifts you may have noticed a familiar name featured in our Figurines collections. Jim Shore figurines are a hallmark for whimsical and timeless American folk art. 1. Jim Shore was born in South Carolina. 2. Figurines are not his only line of work. If you have ever been to a Disney park, you may have found your favorite Disney characters in figurine-form in gift shops or galleries. While Shore is most known for his whimsical Disney Traditions figurines, he also has work in home and garden décor that he plans to expand in the future.2. Shore has figurine collections from other popular American movies and TV shows. 3. Shore has figurine collections from other popular American movies and TV shows. From the wacky cast of Looney Tunes to the lovable characters from Wizard of Oz, you are sure to find your favorite characters from many American classics. He has also created Hanna Barbera collectible figurines featuring new interpretations from The Flintstones ™ and The Jetsons ™. Check out our many Heartwood Creek by Jim Shore figurines available on CoppinsGifts.com! With the New Year arriving, you may have heard a couple of New Year’s resolutions from friends and family. Despite the initial excitement and motivation, a majority of resolutions go amiss. According to BusinessInsider.com, 80% of New Year’s resolutions tend to fail by February. Inspire your friends and families to continue their goals for the New Year with these recommendations. Show that you care about their resolution. Whether it’s going to the gym with them or simply asking how their resolution is going, there are many ways to show your friend or family member how much you care. Show your loved ones that you care with kind words or generous actions. Make your own goal for the New Year. Plan out your own New Year’s resolution and support each other through the year! People are more likely to complete a goal if they have a partner to hold them accountable. Gift them with a whimsical reminder to never quit. Remind your friend or family that they have what it takes to triumph through any mission. 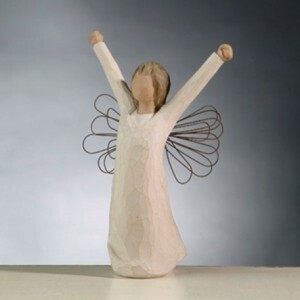 Willow Tree Angels are sentimental figurines that can serve as an encouraging reminder to continue a New Year’s goal. We have a variety of angels that evoke feelings of courage, good health, and freedom. Inspire someone important in your life! Browse through our many Willow Tree Angels at CoppinsGift.com.